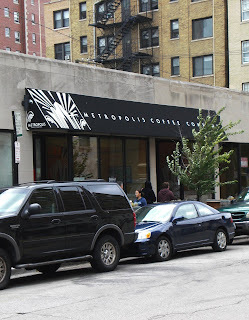 Aspire CoffeeWorks at Metropolis Reviewed by Edgeville Buzz on November 22, 2010 . Every Tuesday at Metropolis Coffee Company (1039 W. Granville), Aspire CoffeeWorks takes over the space in order to package their coffee. Aspire employs two people who bag, grind and label their coffee blends, which they sell in various Whole Foods stores. 100% of Aspire CoffeeWorks’ profits go to Chicago’s Aspire Program, which provides services for people with developmental disabilities. WGN TV’s Marcus Leshock recently visited Metropolis to see Aspire in action. You can read all about his experience over at Chicago Now.